All attempts at peace with our adversaries have failed. The evil ones have constructed great siege engines and our kingdom is under assault. Foul beasts pillage our realm from all sides. How much anguish can one people endure under such cruelty? Hope is all that we have left. The Crystal of Power must be re-forged to cleanse the land of the ills that have been bestowed upon her. One final push is needed to regain the shards of the Crystal of Power. We must re-build our realm, send forth our knights and ride into battle. Our war machine must grind our enemies to dust and take back what is rightfully ours. We must have faith that the Gods will grant us that power that eludes us from a lost age. A DragonLord, the most powerful force known. We must prevail on our Quest for the DragonLords! Quest for the DragonLords - The advanced game expansion provides a new level of intrigue. Each civilization has re-acquired the knowledge from the past and is able to build great weapons of war that includes fortifications and siege engines. As King or Queen of your realm, you may spend your hard earned resources on Calvary, archers, or heavy infantry. Each new unit is unique to its civilization. Orcs can ride wolves into battle and the Dwarf civilization use cannons to bombard their enemies just to name a few. 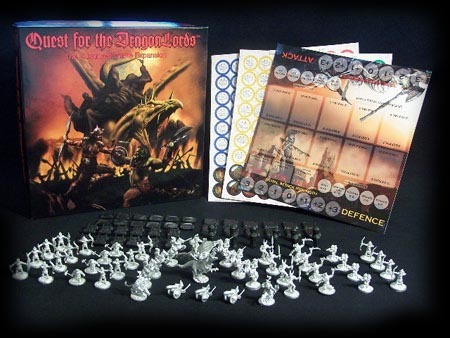 Your imagination is the key to victory with this game of fantasy world conquest. 1 set of plastic miniature catapults, fortifications and watchtowers. *Contents may vary from those listed upon release. 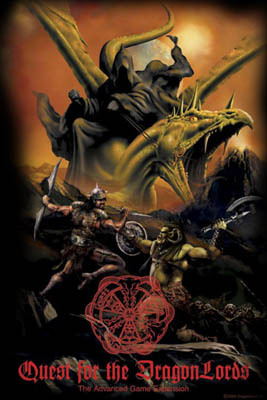 * You must have "Quest for the DragonLords" - The Ultimate Fantasy Adventure game to play this game expansion. The Crystal of Power is the focal point of the universe, binding the fabric of time. In the first age, the Gods fought for control of the Crystal through their demigods, the DragonLords. When the DragonLords clashed, the force unleashed was enough to shatter the Crystal of Power. Shards of the Crystal were thrown to the far reaches of our world, and I suspect even punched through the barriers of time. The second age was a time of darkness and chaos was upon us with the passing of the great crystal. You are our peoples best and last hope. I pass to you a great and terrible burden, a shard of the Crystal of Power. Use it and rule wisely. Save our people, gather the shards and re-forge the Crystal of Power. 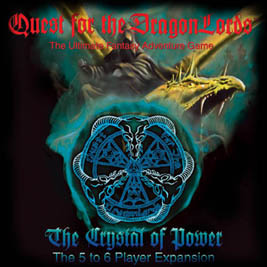 Now five or six players can embark on a Quest for the DragonLords. Two new civilizations fight for control of the shards. The Amazons are female warriors skilled in the art of combat and have the ability to charm their opponents. The Necromancers are the most feared, with the knowledge to raise the fallen. The "Crystal of Power" - The 5 to 6 player expansion comes complete with well over 80 figurines and all new adventures and even more powerful spells. M'Lords, in order to play this expansion, you must have "Quest for the DragonLords"